Mentor Training, Apprentice Orientation (1 Full Day at shop location): Mentor training and apprentice orientation sessions are held, then testing occurs to ensure that Mentors and Apprentices are ready to begin building the apprenticeship program. Upon successful completion of the testing, Mentors and management work with Mentors At Work staff to create the task list, which will form the road map for training. Once completed, the formal apprenticeship program may begin. On-going, bi-weekly management of the Mentors At Work system, which is normally the job of management with the on-line program, is conducted remotely by phone and e-mail by highly-trained Mentors At Work staff: Every other week, at a designated day and time, each Mentor and Apprentice pair within the shop gather around a speakerphone and computer with access to the Internet. The Mentors At Work staff member will conduct a 20-30 minute meeting to discuss the progress made over the previous two weeks, set goals for the next two weeks, and deal with any other issues that need to be discussed. A brief report to shop management is then issued. Three times a year, Mentors At Works experts conduct in-depth, on-site evaluations. Mentors and Apprentices are observed in action and interviewed separately. 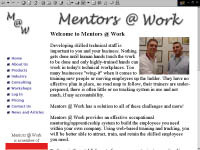 On-going training of Mentors and Apprentices is provided, as needed. Management is fully informed on the progress of the program, positives observed and areas needing attention. All of the above, like the on-line system, is on a one-year renewable contract basis. A discount off the on-line program is available to shops that choose the "We'll Manage It!" option. The "We'll Manage It!" enhancement is billed monthly. “We’ll Manage It!” removes the final barrier to establishing a full-fledged apprenticeship system in automotive shops and can assist the industry in addressing the critical need of workforce development. “We’ll Manage It!” provides outsourced, expert management and in-depth analysis that cannot be duplicated anywhere else. Copyright ©2001 Mentors At Work, L.L.C. All Rights Reserved.